Driven by the new wave of industrialisation and urbanisation that is sweeping through Saudi Arabia, it is not surprising to see hospitality brands setting their outposts outside of the major cities. Radisson Blu announced its first resort in Al Khobar, Saudi Arabia with 137 rooms, suites and private chalets, and it promises to be a stunning resort set on the western shoreline of the Half Moon Bay. Radisson Blu Resort, Al Khobar Half Moon Bay is accessible through the main highways connecting Dhahran to Al Khobar and Dammam, while King Fahd International Airport Dammam (DMM) is 54 km from the resort. The resort features upper-upscale, stylish accommodation with many guest rooms and suites with balcony views of the pool, garden and sea. The individual chalets are situated across a beautiful garden and feature two bedrooms, a living room and private parking. All rooms have high-speed internet and 24-hour room service. 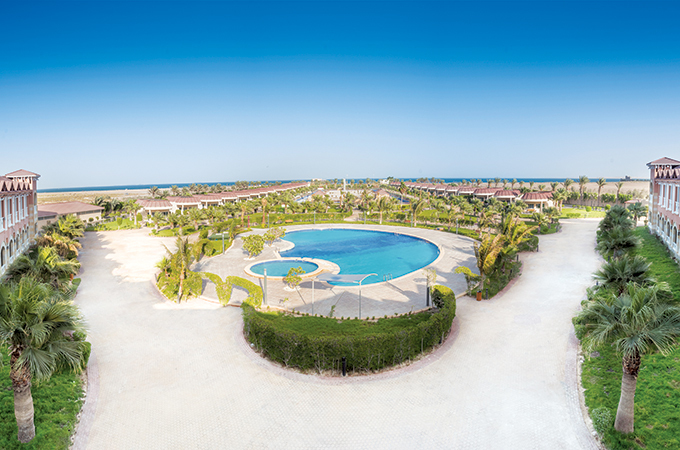 As the largest resort in Al Khobar, the property has access to beautiful sandy beaches, providing the perfect combination of relaxation and unique recreational activities. The resort features health clubs for men and women, an outdoor swimming pool, bicycle rental services and a kids’ playing area. The hotel also provides an easy access to the private beach, with many opportunities for jet-ski, sailing, parasailing, diving and boat trips. Radisson Blu’s main restaurant Larder provides an international buffet including Saudi delicacies and international cuisine for lunch and dinner, while the renowned Radisson Blu Super Breakfast is served daily. The hotel’s lounge provides the perfect space to relax with some snacks, fresh juices, tea and coffee. The Radisson Blu Resort, Al Khobar Half Moon Bay also features an 80 sq m meeting room with facilities that accommodates 40-50 people.